The Oldfield family is considering selling one of legendary driver Barney Oldfield's medals. Here are details on the medals and contact information. 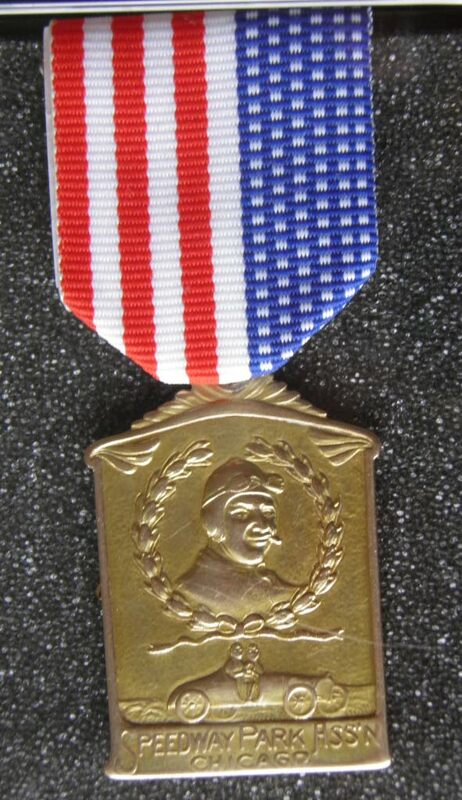 If you would like more information on the Oldfield medals, please contact Wayne C. Petersen, Barney Oldfield's great-great nephew, at wcpetersen7@myway.com . Barney Oldfield, Master Driver of the World, was the first person to lap the Indianapolis Speedway over 100 MPH in the Christie (see above photo). 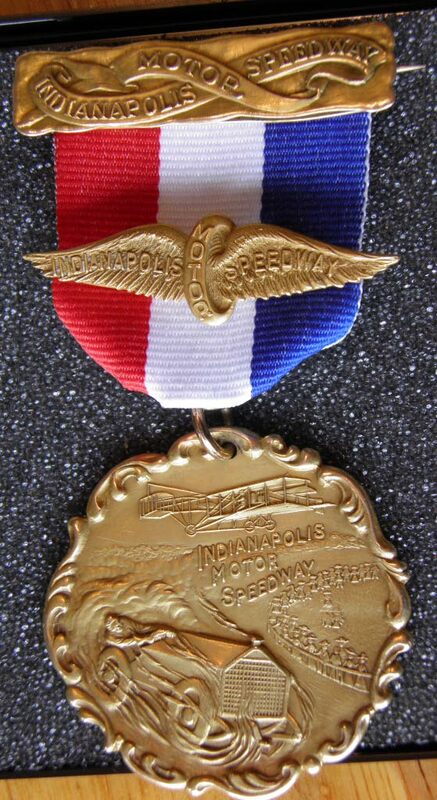 The one and only Indianapolis Speedway solid gold lap record medal. 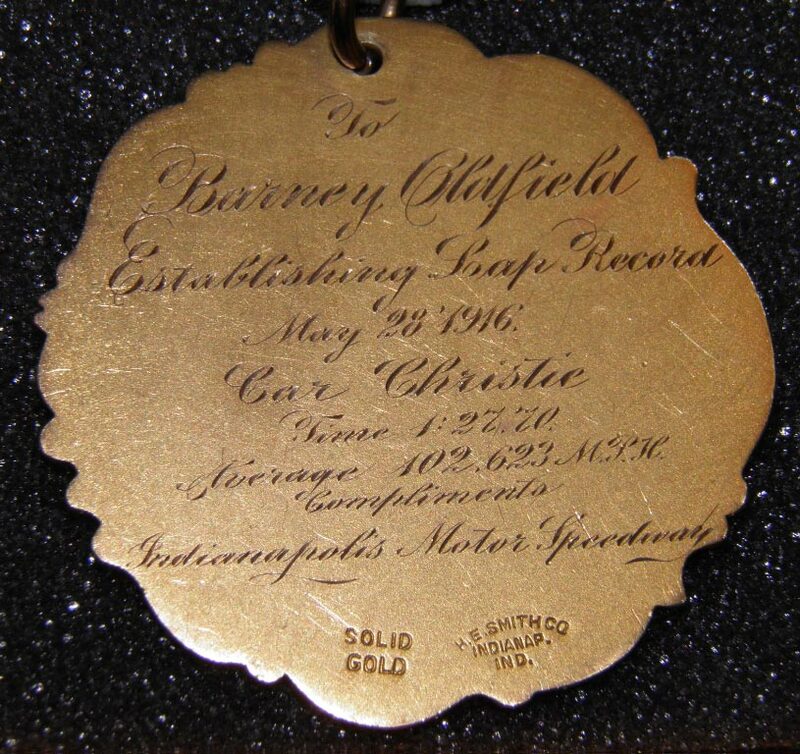 Copy reads: "To Barney Oldfield-Establishing Lap Record May 28, 1916, Car Christie, Time 1:27.7,Average 102.623 MPH, Compliments Indianapolis Motor Speedway "
This is Barney Oldfield, Master Driver of the World, Chicago Speedway gold medal acknowledging Barney accomplishments and naming him the Master Driver. Chicago Speedway gold medal price. 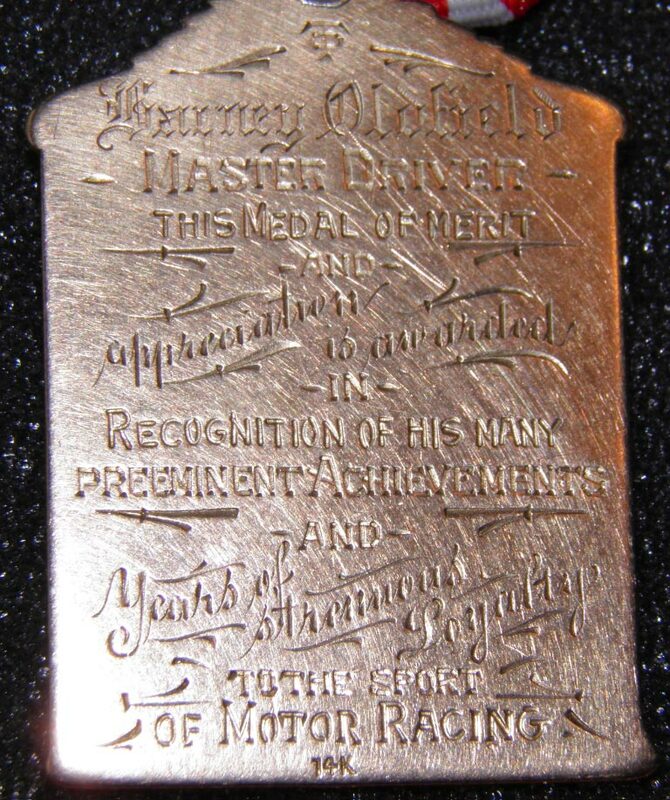 Copy reads: "Barney Oldfield-Master Driver-This Medal of merit and appreciation is awarded in recognition of his many preeminent achievement and years of strength and loyalty to the sport of Motor Racing." 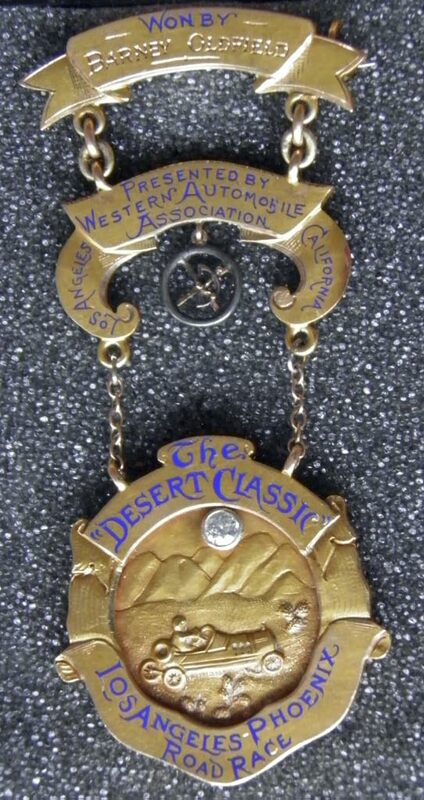 Barney Oldfield Gold Master Driver of the World Medal from the November 1914 Cactus Derby Race also known as the Desert Classic Race from LA to Phoenix. He raced against Olin Davis, Louis Chevrolet, Louis Nikrent, Cliff Durant, Bill Bramlett among a few. Master Driver of the World medal. Presented by Western Automobile Association. 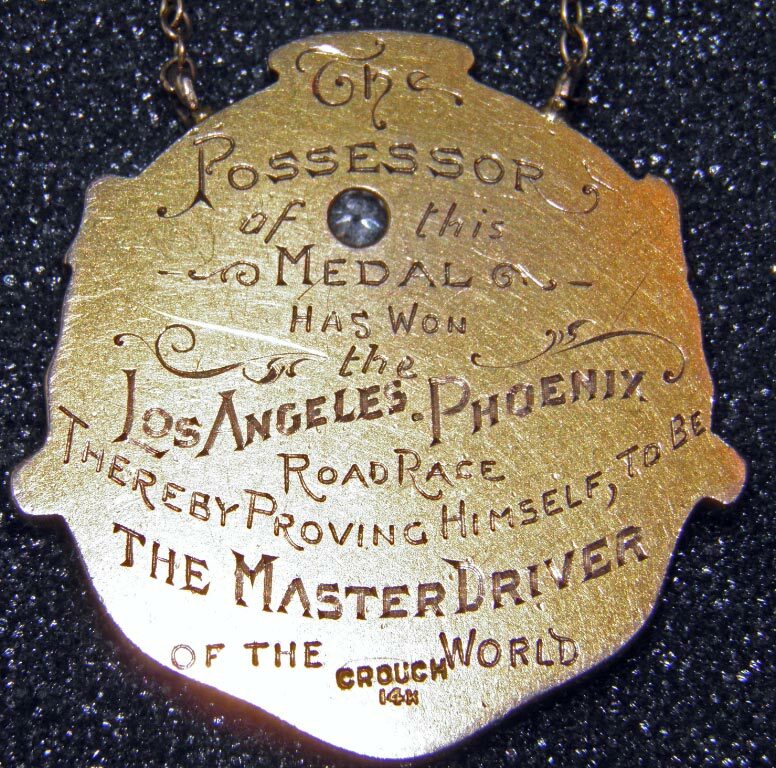 Copy reads: "The Possessor of this Medal has won the Los Angeles Phoenix Road Race, Thereby proving himself, to be The Master Driver of the World" If you would like more information on the Oldfield medals, please contact Wayne C. Petersen, Barney Oldfield's great-great nephew, at wcpetersen7@myway.com .